Erosion control is one of the biggest concerns for many large construction projects. Multiple factors can cause erosion, and every situation calls for specific solutions based on the site and the severity of the problem. Controlling erosion is important not just for preserving the construction site and protecting the new structure but also for minimizing the environmental impact that the project has on the surrounding area. Erosion control measures can add significantly to the project cost, and manufacturers are continually developing innovative products to minimize cost as well as environmental impact. Articulated concrete blocks are revetment systems that can be constructed in a wide variety of shapes and thicknesses. The blocks form a grid of interconnected units used for erosion control on embankments of waterways and manmade drainage channels. Mechanically stabilized earth (MSE) walls have replaced many traditional concrete retaining walls in recent decades. MSE walls offer several advantages over conventional reinforced concrete walls, including ease and speed of installation. This system also is adaptable to a variety of sites. Geotextiles are commonly used to control erosion and improve soils over which roads, embankments, pipelines, and earth-retaining structures are built. Depending on the application, geotextiles may have an open mesh weave, a warp-knitted structure, or a closed fabric or nonwoven surface. The specific type of geotextile used is based on several criteria, including separation, filtration, drainage, reinforcement, sealing, and protection. A French drain is a system of underground piping—called drain tile—that channels surface and groundwater to an exit point. The drain tile may also be perforated to allow water to seep into the soil below the tile, while excess water travels to the exit point. French drains are installed with a slope of about 1 inch of drop per 10 feet of horizontal run. Soil nailing provides a resisting force against slope failures and offers relatively quick installation. The basic installation procedure involves drilling into the soil and placing a series of steel bars—the nails—deep into the earth. The nails are capped at the surface with a facing to create a barrier similar to a retaining wall. Soil nails also can be driven into the soil and may or may not be grouted in place after installation. Riprap is a commonly used method to protect soil from erosion in areas of concentrated runoff. Riprap is a layer of very large stones interlocked together to act as a barrier on slopes that are unstable because of seepage problems or areas that are receiving a large, concentrated flow. This method is commonly used to minimize erosion of lake shores and riverbeds. 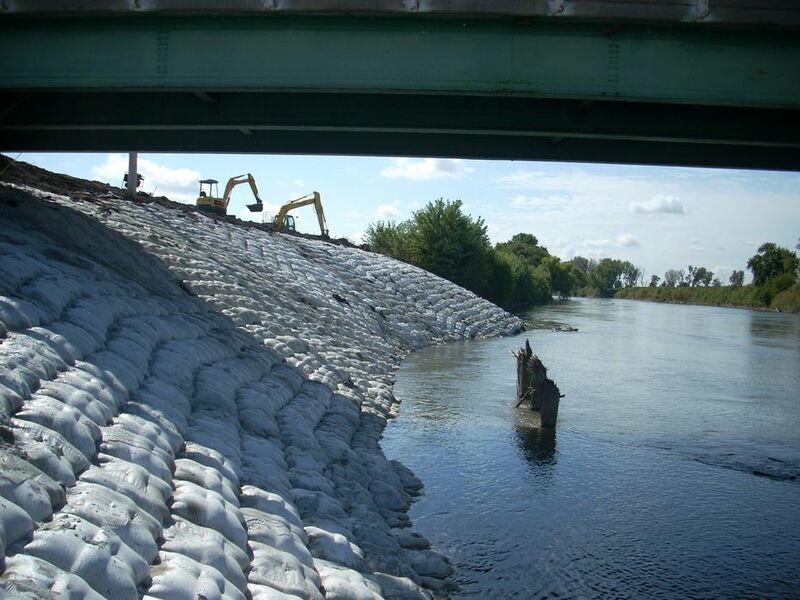 Riprap often is installed over a synthetic geotextile membrane to prevent the soil from moving through the riprap. Dust control measures apply to any construction site where there is the potential for air and water pollution from dust traveling across the landscape or through the air. Dust also represents the potential for wind erosion. Common methods for dust control in soil include misted water, silt fences (and similar barriers), and polymer additives.